The ultrasensitive estradiol test measures your estradiol ultrasensitive blood level. What is the estradiol ultrasensitive test? The ultrasensitive estradiol test is a more sensitive estradiol blood test. Why is the ultrasensitive estradiol blood test important? The ultrasensitive estradiol test provides a more detailed assessment of estradiol for people undergoing TRT. This Estradiol Ultrasensitive Test is a blood test. The estradiol ultrasensitive test measures the estradiol ultrasensitive blood level. Ultrasensitive estradiol testing is a more sensitive way to measure estradiol levels. In contrast to the estradiol test which uses an immunoassay methodology, this estradiol ultrasensitive test uses a liquid chromatography/tandem mass spectrometry (LC/MS/MS) methodology for extra result sensitivity. The estradiol ultrasensitive test can help in evaluating men with gynecomastia and is sometimes ordered with the total & free testosterone test by men who are undergoing testosterone replacement therapy. To get an estradiol ultrasensitive test near you, order online and get tested at the Quest Diagnostics lab. 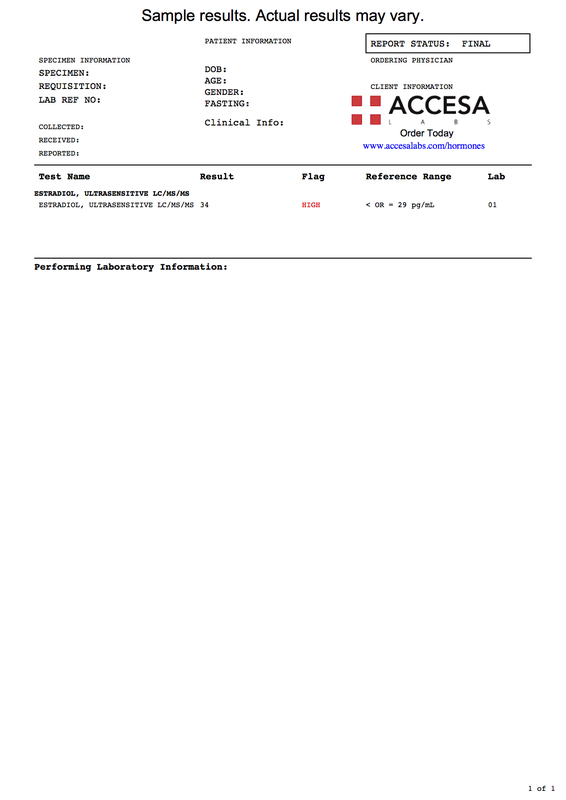 As can be seen on the sample estradiol ultrasensitive lab report, blood levels are reported as a number and can be compared against the reference range provided by the lab. Please note that this estradiol ultrasensitive test was developed and its analytical performance characteristics have been determined by Quest Diagnostics. It has not been cleared or approved by FDA. This assay has been validated pursuant to the CLIA regulations and is used for clinical purposes. Estradiol Ultrasensitive Test at Guaranteed Prices.